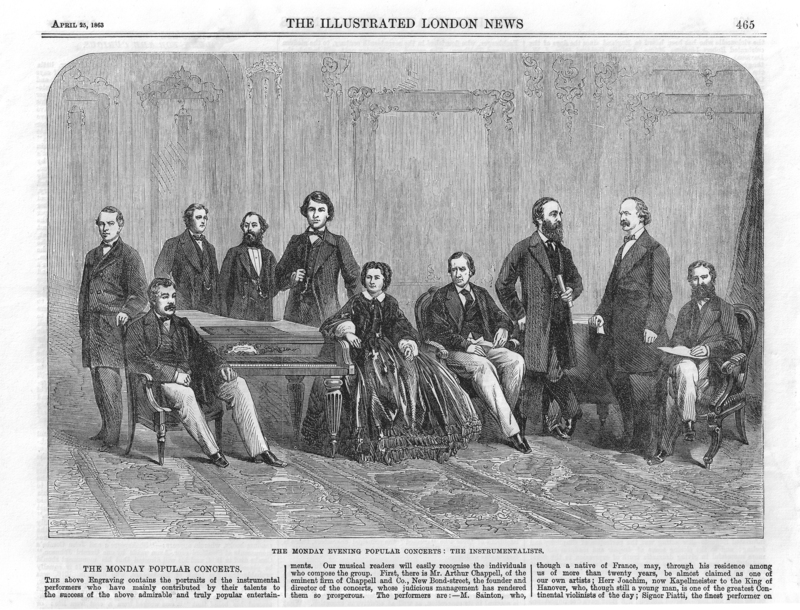 The Illustrated London News, April 25, 1863, pp. 465-466. Seated, L-R: Arthur Sullivan, Arabella Goddard, Charles Hallé, Prosper Sainton. Standing, L-R: Lindsay Sloper, Louis Ries, H. Webb, Joseph Joachim, Arthur Chappell, Julius Benedict. The above Engraving contains the portraits of the instrumental performers who have mainly contributed by their talents to the success of the above admirable and truly popular entertainments. Our musical readers will easily recognise the individuals who compose the group. First, there is Mr. Arthur Chappell, of the eminent firm of Chappell and Co., New Bond-street, the founder and director of the concerts, whose judicious management has rendered them so prosperous. The performers are: — M. Sainton, who, though a native of France, may, through his residence among us of more than twenty years, be almost claimed as one of our own artists; Herr Joachim, now Kapellmeister to the King of Hanover, who, though still a young man, is one of the greatest Continental violinists of the day; Signor Piatti, the finest performer on the violoncello who has been heard in England since the days of the celebrated Robert Lindley; Mdme. Arabella Goddard (Mrs. J. W. Davison), a young and charming lady, who has no superior among the great female pianists of the day; Mr. Charles Halle, a pianist of the highest order, and for many years director of the Manchester Concerts; Mr. Benedict, a favourite pupil of Weber, who, during a residence in England of more than a quarter of a century, has distinguished himself in the highest branches of his art, especially in the musical drama—his operas of “The Gipsy’s Warning” and “The Lily of Killarney” having acquired a European celebrity; Mr. Lindsay Sloper, a musician of high reputation, both as a composer of genius and as an excellent performer on the pianoforte; Herr Louis Ries, and Mr. Webb— the one a violinist, the other a tenor-player—gentlemen who do not come before the public as solo performers, but who are well known in our musical world as quartet-players of the utmost finish and refinement, and whose talents have greatly contributed to the excellence of the Monday Popular Concerts.